Ohio will, today, celebrate the fourth year in a row of winning the Governor's Cup from Site Selection magazine for having achieved the most economic development projects in 2009. 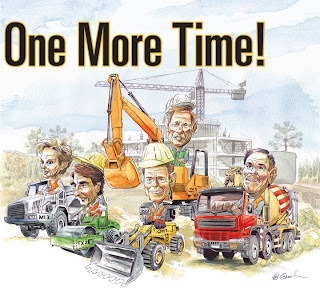 The cover story depicts Governor Strickland on a bulldozer. This is good news and as my Tuesday evening blog post said, the win is accredited to the non-urban parts of Ohio. The magazine story leads off with some of the largest projects in Ohio that helped put Ohio over the top of others states. Projects in Circleville, Wellston, and Clyde, Ohio lead off the list. Though we'll wait for the complete list of project locations that gave Ohio the win, if history is any indication, it will, again, be the suburban and rural parts of Ohio that won it for the state. Time to recognize the 'burbs and invest in success. The efforts to erode Ohio's ability to compete for wins like these have to stop.